Only at the Show, the Dungog Show that is! Who will be the jockeys? Will there be a Calcutta? 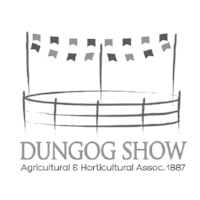 This is a must see event at the Dungog Show. Whether you've been competing for years or are a first time lego entrant, get your creative skates on! Entries for all Pavilion classes are encouraged and the classes are designed to be a fun experience. There are classes for all ages and levels and you never know who is going to win! The horse and stud stock competitions are some of the oldest competitions held on the Showground. They recognise the best of the best and reward the achievements of competitors and breeders. The quality of animals is always high and competition is exciting. In 2017 the Main Arena is showcasing sports that have an element of danger, are definitely crazy and great for a side splitting laugh. Don't miss the CAMEL RACES, the TRACTOR PULLING COMPETITION, the DEMOLITION DERBY and of course the FIREWORKS. Is your dog a jumper or a dasher? Punters from across the district flock to Dungog to watch the annual Dachshund Dash. The dachshunds are put through their paces in a series of sprint races to earn the title of Dungog Dasher! If your dog has a bit more spring in their leg, try your go at the dog high jump. This exciting competition is open to ALL dogs, and allows them to demonstrate their awesome upward mobility skills. What? You thought Showgirl is outdated and out of touch? Well, come on a journey that can offer you experience, adventure and a great foundation for your future. Its a fun day of learning and discovery about agriculture. The Junior Farm Hands Adventure helps children understand where their food and fibre comes from and the role agriculture plays in our everyday lives. The program varies each year, but essentially the children rotate through a number of stations to learn about agriculture, what happens on our local farms, who might work on them and other interesting facts about what happens in agriculture in our district. Sign up with your email address to receive news and updates from Dungog A&H Society.